Melbourne city council erroneously fining Uber drivers for stopping in loading zones. RSDU has been receiving a number of complaints from drivers recently, describing how Melbourne council is failing to apply the correct road rules (when it comes to Uber drivers) and issue drivers with fines for stopping to pick up or drop off passengers in loading zones. Since 31 December 2017, all Uber vehicles are required by law to have hire car licenses to be able to operate in Victoria. The license is being issued by the CPVA (Commercial Passenger Vehicle Authority) formally known as the TSC, Taxi Services Commission, a body which according to the Transport Act 1983 is authorised to issue these licenses. The license clearly classifies Uber/Ride Share cars as VH – Victorian Hire car, licensed to commercially carry passengers. A driver that has recently contacted us claimed to have been incorrectly fined by Melbourne Council inspector for stopping in a loading zone while on the job and was given the “pay the fine or go to court” notice after requesting for the matter to be reviewed. The Council described the types of vehicles allowed to stop in loading zones (note underlined text applicable to Uber drivers). The Council then continued to advise the driver he was not considered authorised to stop in a loading zone. 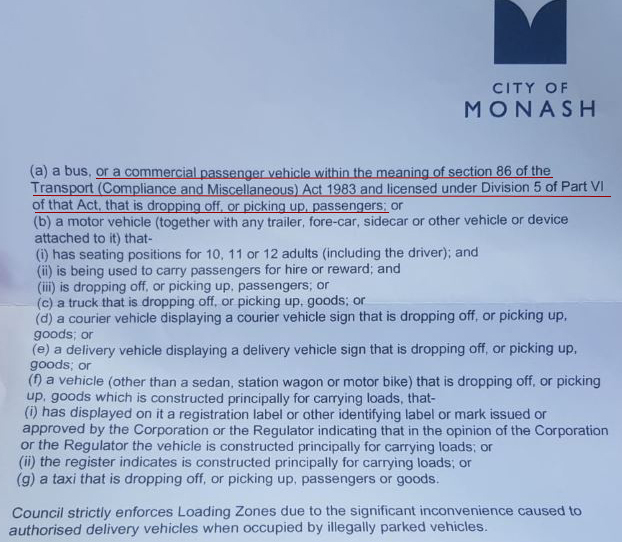 This however strongly conflicts with the Transport Act 1983, clearly acknowledging the CPVA (formerly known as TSC) authority to issue VH licenses, the license wording pointing to the Transport Act 1983, clearly classifying Uber vehicles as ‘commercial passenger vehicles’. 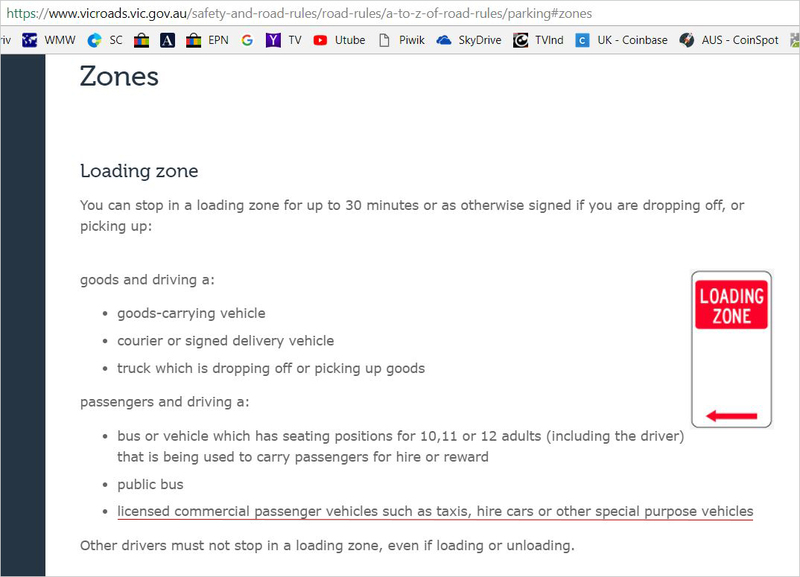 Furthermore, a quick search through the Vicroads website reveals that they too consider Uber drivers to be operating commercial passenger vehicles and therefore allowed to stop in loading zones for passengers pick-up and drop off. (Note underlined text). Not only Melbourne City Council inspectors are failing to correctly apply the law when it comes to Uber drivers stopping to pick up or drop off in loading zones, Melbourne council later reject requests for a review of such obvious error(s), intimidating drivers into paying illegitimate fines or having to go to court and risk being out of pocket on legal costs. It is hard enough for Uber drivers to find a place to stop in Melbourne CBD to pick-up or drop-off passengers, drivers can not stop in taxi or bus zones. Loading zones therfore are absouloutly essential for this purpose. Melbourne council instead of taking the lead and addressing this issue have chosen to issue drivers with illegitimate fines for simply utilising their legal rights. This is definitely a class action waiting to happen and we encourage affected drivers to contact us and share your experience so we can learn more on the size of the problem and take the matter further if necessary.